Karl Wolff is a LibraryThing Author, an author who lists their personal library on LibraryThing. See Karl Wolff's author page. The Coming of the New Deal, 1933-1935 (The Age of Roosevelt, Vol. 2) by Arthur M. Schlesinger Jr.
About meI'm a voracious reader. I love fiction and non-fiction. I also write fiction, speculative fiction, and book reviews. site (http://www.joebobbriggs.com/) and my own blog "The Driftless Area Review" (http://driftlessareareview.com/). Follow me on Twitter and/or Like me on Facebook (links below). I'm also a member of the National Book Critics Circle (bookcritics.org). To publishers and authors: If you are interested in having me review your book, send a query letter to driftlessareareview @ hotmail . com. I will send you information on where to address the review copy. I will read pretty much anything put in front of me. Reviewing books via Early Reviewers, the Joe Bob Briggs website, the New York Journal of Books, and CCLaP have exposed me to hidden gems amidst the dross and slag. I've also found rare and forgotten treats on the shelves of used bookstores and places like Goodwill and Savers. A quick glance of my Library and my reviews should give you a good picture of my tastes, preferences, and interests. My tastes are pretty scatter shot. I like the Great Writers (Proust, Pynchon, Beckett, etc.) 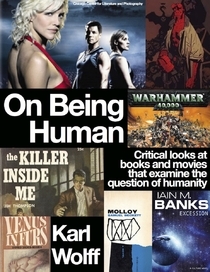 as well as more popular commercial stuff like Andrew Vachss, James Ellroy, and Warhammer 40K novels. "But I've developed a great reputation for wisdom by ordering more books than I ever have time to read, and reading more books, by far, than I learned anything useful from, except, of course, that some very tedious gentlemen have written books. ... Thank God for them all, and for that strange interval, which was most of my life, when I read out of loneliness, and when bad company was better than no company. You can love a bad book for its haplessness or pomposity or gall, if you have the starveling appetite for things human, which I hope you will never have." -- "Gilead" by Marilynne Robinson. My library is an amalgamation of a lifetime. It's an example of wide-ranging, generalist taste, everything from fiction to non-fiction, pop to High Art and everything in between.